And, if you keep my commandments and endure to the end you shall have eternal life, which gift is the greatest of all the gifts of God (D&C 14:7). Isaac and Rebekah were to be married. Their families were joyful that these young people had found someone faithful to marry. They knew how important it was to be married in the covenant. (When you are married “in the covenant,” you are sealed by the holy priesthood to be married to each other for eternity. That is Heavenly Father’s promise to you; you promise Him to live to be worthy of this blessing.) They knew that if Isaac and Rebekah married in the covenant, they would receive many wonderful blessings. Everyone was happy. Does this sound like other young men and women you know who marry in the covenant by being sealed in the temple? It is. The difference is that Isaac and Rebekah lived thousands of years ago, during Old Testament times, and they didn’t know each other before becoming engaged. Isaac’s father, Abraham, knew how important it was for Isaac to marry a faithful woman who believed in God as he did. Abraham knew that doing so was the only way that Isaac could be married in the covenant and receive all the blessings that Heavenly Father had promised. Abraham was so concerned about this that he sent his servant miles and miles away to search for the woman with the same religious beliefs as Isaac and who was chosen by God for him to marry. The Lord helped Abraham’s servant find Rebekah. She agreed to marry Isaac, even though she had never met him. You can read more about Isaac and Rebekah’s marriage in Genesis 24. Why was it so important for Isaac and Rebekah to marry someone in the covenant? Why is it important for you to marry a righteous member of the Church in the temple? When you are married in the temple, you are promised the blessings of Abraham, Isaac, and Jacob (see Gen. 22:17–18). One of these blessings is that you and your family, through priesthood power, can be sealed together forever. This is a wonderful gift from Heavenly Father. The Lord promised this and other blessings to Abraham’s righteous descendants. They were promised the priesthood and were given the responsibility to teach the gospel to others so that all families everywhere might have “the blessings of salvation, even of life eternal” (Abr. 2:11). When you grow up and go to the temple, you will learn more about the blessings of salvation and the great plan of happiness. You will make covenants. If you keep your covenants, Heavenly Father will bless you with “the greatest of all the gifts of God,” which is eternal life (see D&C 14:7). By choosing to marry in the covenant, as Isaac and Rebekah did, you can have the great blessings the Lord wants to give you and your family. Remove page 21; cut the puzzle apart along the broken lines. This is a two-sided puzzle. After you mix up the pieces, you can look at the pictures at the top of this page to see how to put the puzzle together. 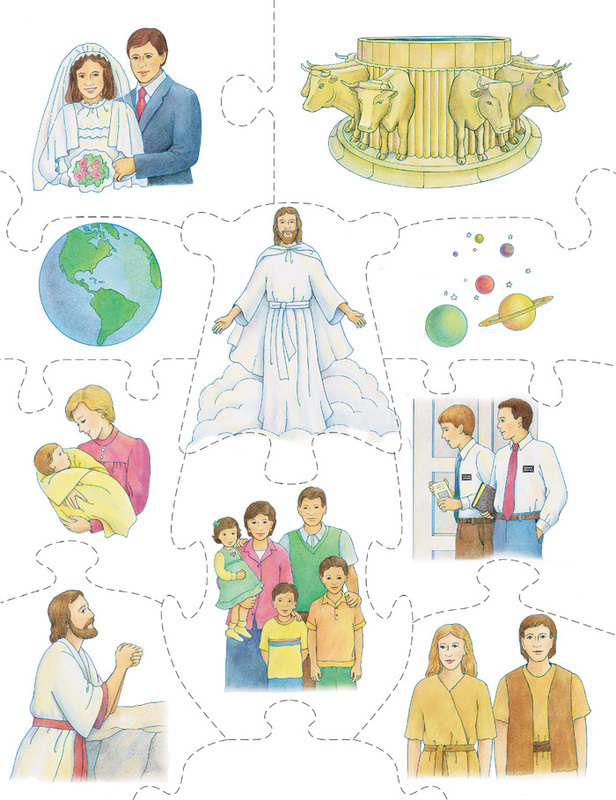 Going to the temple is like looking at the box-top picture of a jigsaw puzzle. In the temple, we see better how we need to fit the many parts of the gospel together to obtain exaltation. 1. 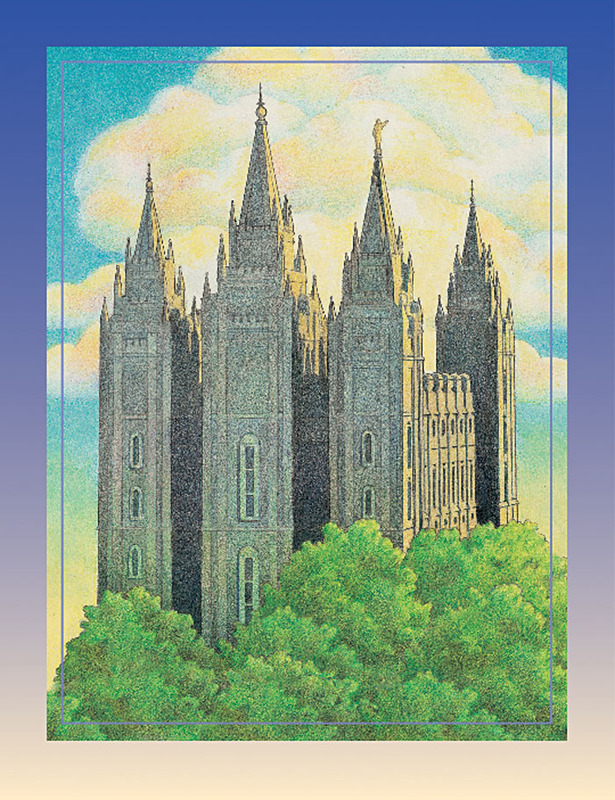 Invite four adults to tell about prophets who have received revelation in the temple. Have them explain what was revealed and how it was revealed in the following instances: (1) Samuel﻿—1 Sam. 3:1–20; (2) Joseph Smith﻿—D&C 110, 137; (3) President Spencer W. Kimball﻿—OD 2; (4) Lorenzo Snow﻿—Primary 1 manual, p. 85 or Friend, Aug. 1993, pp. 14–15. Have the storytellers emphasize that the temple is the house of God. Explain that when we go to the temple, we can also feel Heavenly Father’s Spirit and receive personal revelation. Help the children memorize the ninth article of faith by cutting several copies of it into separate words and putting each copy into an envelope. Divide the Primary into groups of about five children. Give each group one of the envelopes. Have them put the words in order as the music leader sings “The Ninth Article of Faith” (p. 128) or a member of the presidency repeats the article of faith to help the children. Continue singing or repeating it until all of the groups have put the words in order. As a group completes the activity, have them sing or say the article of faith with the music leader or presidency member until they have it memorized. 2. Read John 14:26. Explain some of the ways that the Holy Ghost can reveal or help us remember things: dreams; visions; ideas; peaceful feelings; still, small voice. Sing “The Still Small Voice” (pp. 106–107). We can receive personal revelation in the temple (see Sharing Time Idea #1) and other places as well. Help the children understand that personal revelation may be received as a result of asking in prayer, reading the scriptures, and keeping the commandments. Find or draw simple drawings of the outdoors, a jail, a mountain, and a room in a house. Hang them in the four corners of the Primary room. Tell the children that they will learn about people who received revelation in each of those places. Divide the children into four groups and, using stations (see TNGC p. 179), have the children learn about revelations that were given in each of these locations: outdoors﻿—Enos (Enos 1:1–5), Joseph Smith (JS—H 1:14–19), or Mary Fielding Smith (Primary 5 manual, pp. 246–248); jail﻿—Joseph Smith (D&C 122 or Primary 5 manual, pp. 180–183); mountain﻿—Moses (Ex. 3:1–6; 24:12–25:8); room﻿—Joseph F. Smith (D&C 138: heading, 1, 11), Lehi (1 Ne. 1:5–8), or Mary (Luke 1:26–38). Sing songs from the “Prayer” and “Scriptures” section of the CS as the children move from station to station. Have the children write about or draw a picture of a time when they received inspiration or felt joy at home, at church, at school, or at a special occasion. They might also draw a picture or write a description of a place where they pray, read the scriptures, or where they might receive personal revelation. Have them add the page to their temple booklets or place them in their journals. 3. Help the children learn about the Savior and temple ordinances by showing parts of the video Special Witnesses of Christ (item #53584). Explain to the children that one role of the prophet and the Apostles is to testify of the Savior. To help the children focus on the message of each video segment, write the following song titles from the CS on the chalkboard in random order. Show a video segment, have the children choose a song that they feel goes with that segment, then sing it while you are locating the next segment. If the video is not available, ask someone to read the text from the Ensign, Apr. 2001, pp. 2–21. You may wish to preview the video to help you locate the needed segments more easily. Suggested video segments and songs could include: • Elder Russell M. Nelson, “I Lived in Heaven,” p. 4; • Elder Richard G. Scott, “When Jesus Christ Was Baptized,” p. 102; • Elder Henry B. Eyring, “I Love to See the Temple,” p. 95; • President Gordon B. Hinckley, “Jesus Has Risen,” p. 70; • President Boyd K. Packer, “The Hearts of the Children,” pp. 92–93; • President Gordon B. Hinckley, “The Sacred Grove,” p. 87. If time permits, show the rest of the video. Bear testimony of the blessings of having living prophets today and of the blessings that the temple brings to us. 4. Display pictures of some of the children’s parents when they were younger. Have the children guess whose parents they are. How did they know? Frequently we look like our parents. List on the chalkboard physical traits we inherit from our parents: eye color, hair color, height, etc. We are also sons and daughters of Heavenly Father. How do we know this? Display a picture of the First Vision (GAK 403). We learn from the scriptures that we were created in Heavenly Father’s image (see Gen. 1:26–27) and that He has a body of flesh and bones (see D&C 130:22). Sing “I Am a Child of God” (pp. 2–3). On the chalkboard draw a ladder with seven rungs leading from a circle labeled “Earth” to an area labeled “Heaven.” Heavenly Father promises that we can have an inheritance in His kingdom and return to live with Him if we do certain things. Make the following seven wordstrips with the scripture references written on the front and the song titles written on the back: Hebrews 11:6﻿—“Faith” (pp. 96–97); 3 Nephi 11:38﻿—“When I Am Baptized” (p. 103); Doctrine and Covenants 10:55﻿—“The Church of Jesus Christ” (p. 77); Mosiah 15:11﻿—“We Listen to a Prophet’s Voice” (Hymns, no. 22); Doctrine and Covenants 6:37﻿—“Keep the Commandments” (pp. 146–147); John 13:15﻿—“I’m Trying to Be like Jesus” (pp. 78–79); and Matthew 7:21﻿—“I Will Follow God’s Plan” (pp. 164–165). Place a wordstrip below each ladder rung. Have the children take turns choosing a wordstrip. As the Primary sings the song, the child’s class tries to find the scripture before the song is finished. Have the child read the scripture and write on the ladder rung what we need to do to receive our eternal inheritance. For younger children: Teach the following finger play. “A tiny seed can grow to be” (Thumb and index finger together) / “A shady, leafy apple tree.” (Arms held up as branches) / “A bunny has a funny habit” (Wiggle nose) / “Of growing up to be a rabbit.” (Two fingers [ears] up; stroke with the other hand) / “Have you seen a pollywog?” (Hands swimming) / “It will grow up to be a frog.” (Left palm up for lily pad; right hand [frog] jumps onto pad) / “What of children in a row?” (Both hands, all fingers up) / “Do you think that they will grow?” (Arms extended up) / “Of course they will, and there is One” (Pointer finger up) / “In whose image they become.” (Right arm up) / “Children of God may grow to be” (Nod head yes) / “Like Him by living faithfully.” (Fold arms). Have the children draw pictures to illustrate the finger play, including a picture of themselves now and what they hope to become. 5. Song presentation: Have a Primary presidency member teach the plan of salvation, using and displaying the following pictures: diagram of the plan of salvation (see Primary 6 manual, p. 2); picture of pre-earth life (Primary 3 manual, picture 3-3); the world (GAK 600); helping others (Primary 3 manual, picture 3-27); and a happy family (GAK 616). Refer to the visual aids as you teach the song “I Will Follow God’s Plan” (pp. 164–165). Divide the Primary into five groups. Assign the first three groups to each listen for either the first, second, or third phrase that begins with “My life.” Have the fourth group listen for the words following “My choice,” and the fifth group for what we seek. Sing the song up to “direct me from birth.” Sing that much of the song again, singing the first two words, then pointing to the group assigned that phrase and having them sing the rest of the phrase with you. Now have the entire Primary sing the completion of each phrase. Point to the appropriate pictures hanging on the wall to help the children remember these phrases: “my life has a plan” (plan of salvation), “in heav’n it began” (pre-earth life), “to this lovely home on earth” (the world). For the second half of the song, ask the same five groups to listen for the first, second, third, fourth, or fifth “I will” as you sing it through once. Sing the second half again, this time pointing to each group in turn. Have them stand as they sing their phrase to show their commitment to what they will do (follow, work, pray, walk in his way, be happy). Sing the second half a third time, asking the children to stand up when they hear their phrase. Sing the second half of the song once more, pointing to the appropriate picture: “always walk in his way” (helping others) and “I will be happy” (happy family). Have the children sing the entire song. Bear your testimony about the blessings that come from following God’s plan. 6. Additional Friend resources: “Emily’s Heritage,” Aug. 1999, pp. 8–10; “Ina,” Oct. 1999, pp. 10–12; “Thirst!” June 2000, pp. 20–22; “Lost in the Jungle,” June 2000, pp. 40–42; and “‘Joseph Smith Said He Saw Two Personages,’” Oct. 2000, pp. 40–41. Additional Sharing Times in the Friend: “The Plan of Salvation Offers Me Peace,” Mar. 1994, pp. 14–15; “Ponder, Pray, and Listen,” Apr. 1996, pp. 4–5, 26; “One of God’s Greatest Gifts,” June 2000, pp. 43–45.